THE FIRST FIFA-accredited, synthetic turf football pitch in the City of Ryde will be built by next week. The all-weather, synthetic turf field at Christie Park will be the home ground of the Gladesville Hornsby Football Association and clubs that include Ryde Magic, the Gladesville Ravens and North West Sydney Koalas. 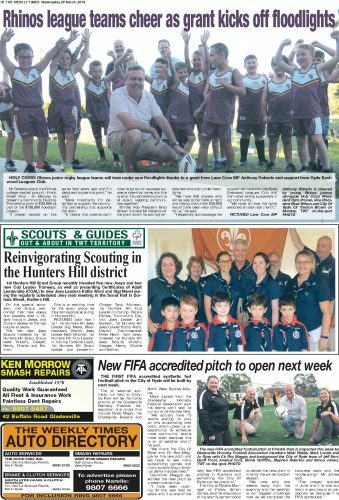 Mark Lockie from the Gladesville Hornsby Football Association said his teams can’t wait to run out onto the new field. “We actually have 15 teams waiting to play on this outstanding new pitch, which gives us an opportunity to schedule more community teams more often because this is an all weather pitch,” he said. Councillor Maggio described the new pitch as a dream come true. The City of Ryde’s Manager of Parks, Simon James, said he was proud of his team’s performance to deliver the new pitch in time for the winter football season. “We now only two weeks away from the opening and the weather is our biggest challenge now as we complete the concrete work and the landscaping,” Mr James said.